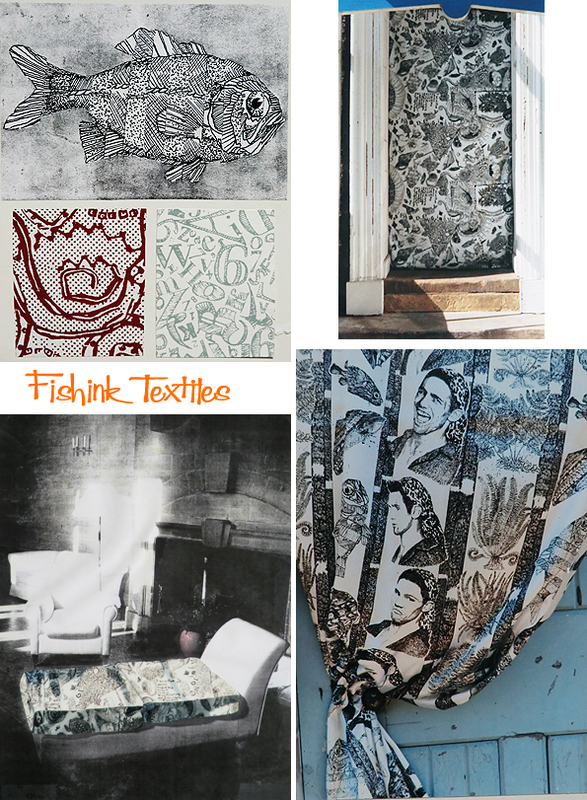 I was going through my old portfolios the other week and came across some of the work I did at Nottingham Polytechnic in the late Eighties, whilst taking my Textile Design Degree. I recalled how much time and energy went into that course for me and how much I enjoyed it too. It was honestly one of the best learning experiences I’ve had during my life and in a place full of amazing opportunities. We had a huge print room facility on hand, available to use pretty much most of the week. Space to spread your work out and print long lengths of fabric without getting in other people’s way and of course the luxury of getting a grant (albeit only about £30 a week to live on) but not, like the generation of today, having the weight of a substantial loan over your head when you leave after three years hard labour! Fortunate times I feel. I thought I’d share some of the work with you as it’s so different to what I’m doing now. 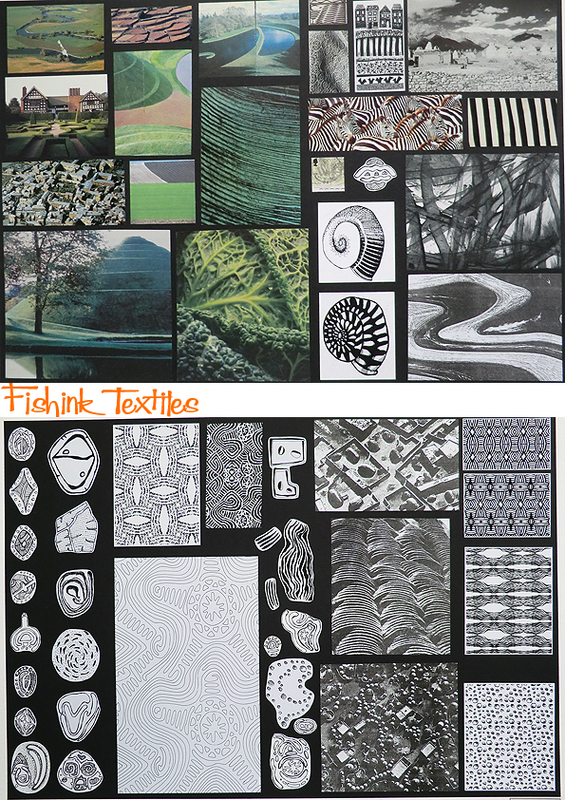 This initial collection was a competition run yearly by Deloitte Haskins and Sells, the firm of accountants, who worked with so many local textile companies that they wanted to put something back into the industry and so established this design award. I was fortunate to win second prize (£500) with a furnishing design, loosely based around a trailing Rose idea. 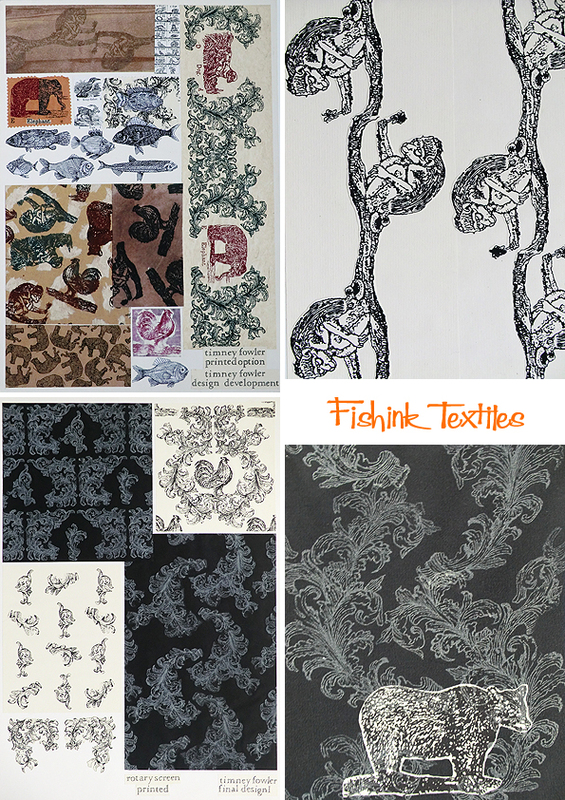 I produced preliminary sketch ideas, other alternative fabric and design considerations, a sample of the fabric and one of the design in it’s final colours, an alternative colourway and lastly, a visual to show what it would look like in a room setting, covering a piece of furniture. 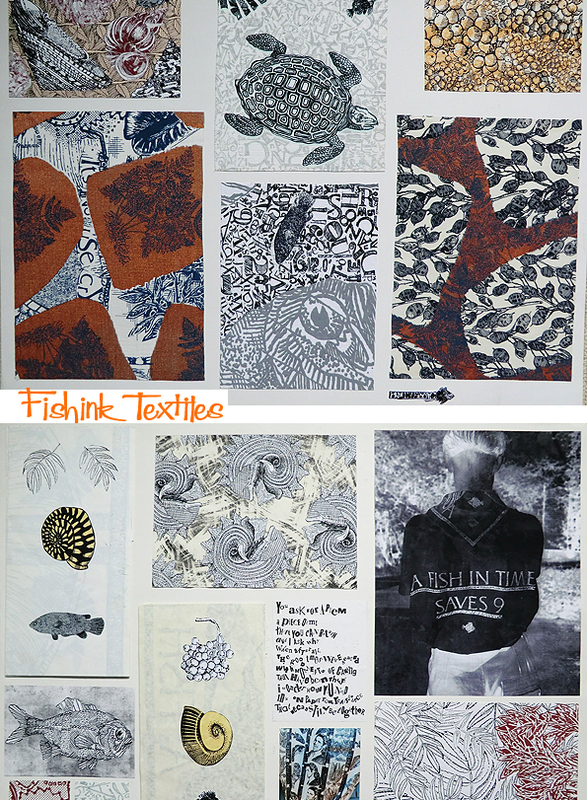 During the Eighties, I was fascinated by the work of British Textile design duos English Eccentrics and Timney Fowler. I loved their finely engraved lines and controlled bold imagery. 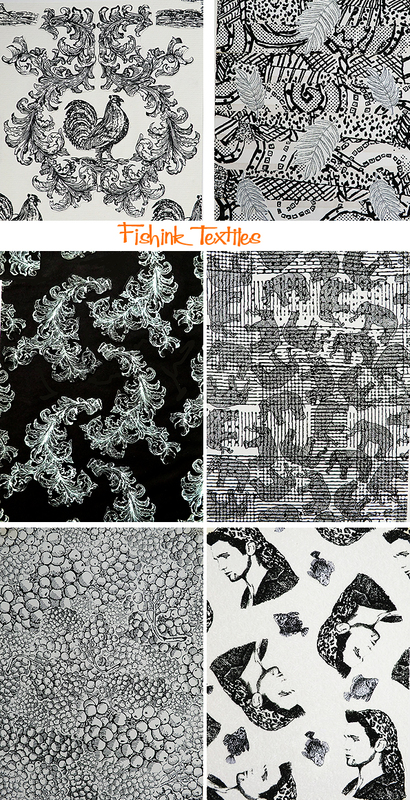 They inspired me to produce my own, slightly more amusing ranges of textile designs, using animals and scroll-like flourishes as my main sources of inspiration. 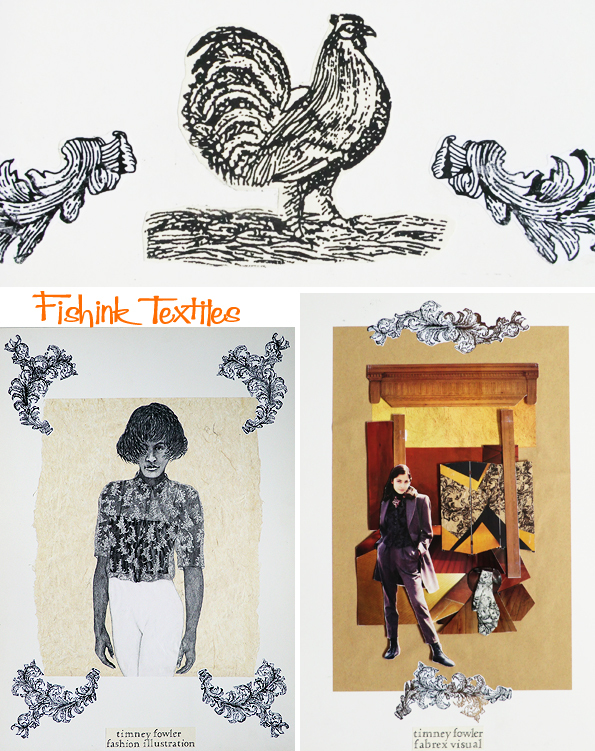 This collection was created with my textile hero’s in mind, as though I was creating a collection for them. 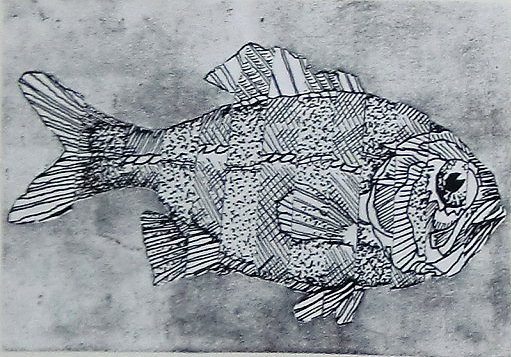 You can just see the early use of fish appearing in my work too. 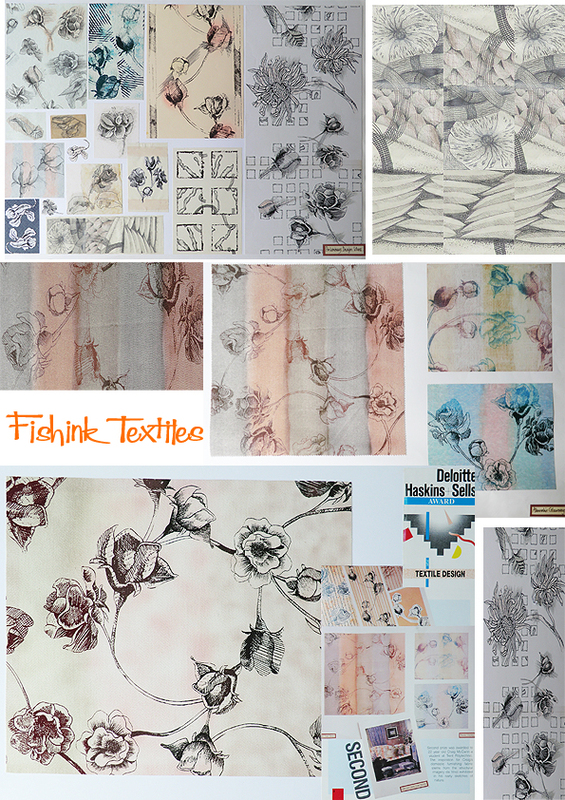 Design visuals, for a women’s blouse printed on a silk, or organza type fabric. 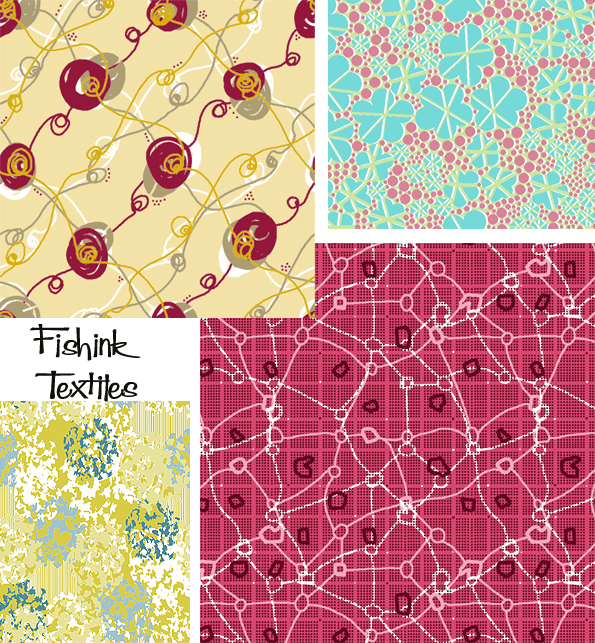 And a few more fabric design ideas. From there, the work for my final degree show took it’s beginnings. 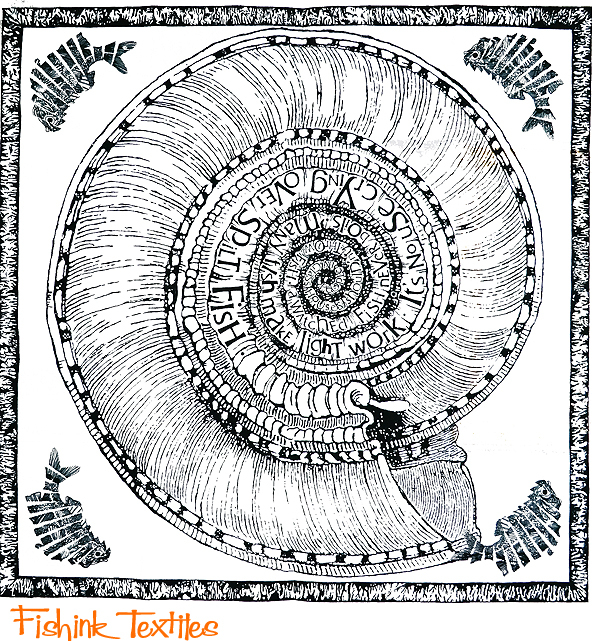 More engraving-style illustrations, created by my own drawings of animals, sea-life, lettering, plants and the work of another hero of mine, photographer Bruce Weber. Humour has always been an important element in my designs and I try whenever possible to incorporate it into my work. 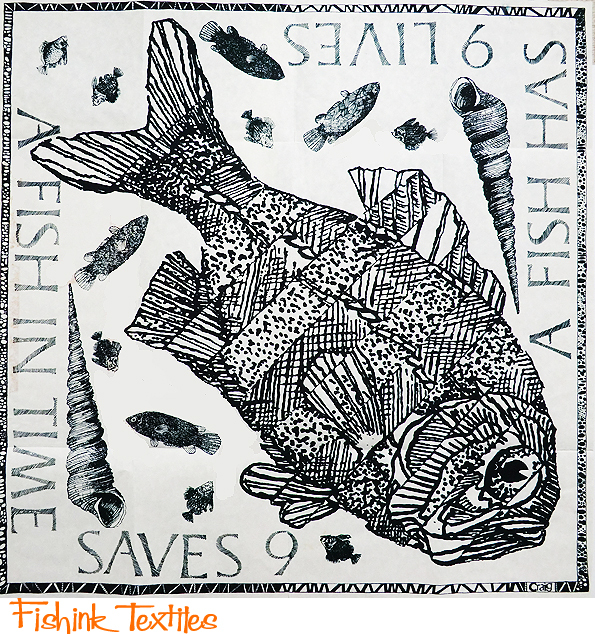 So here I’d taken what were traditional sayings but played around with them, by introducing my Fish elements, which appeared to be growing in interest as a subject matter for me. 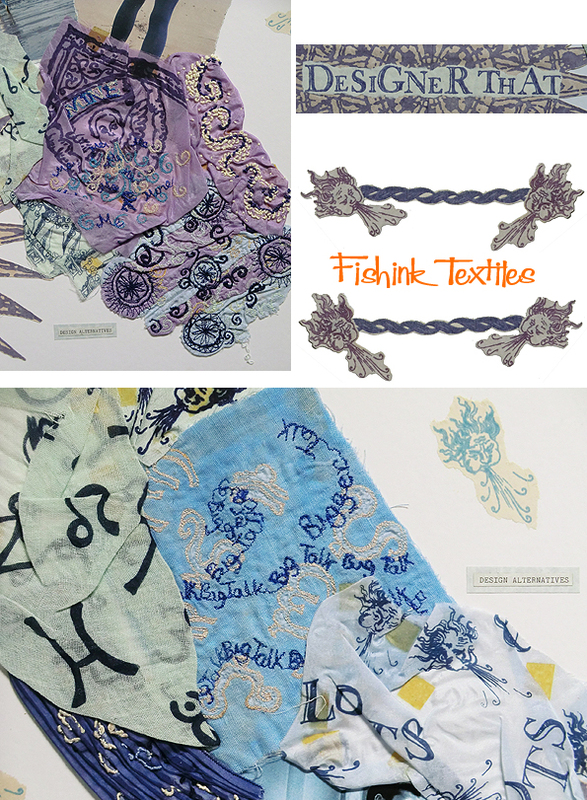 Below are two silk scarf designs I produced for my degree show. 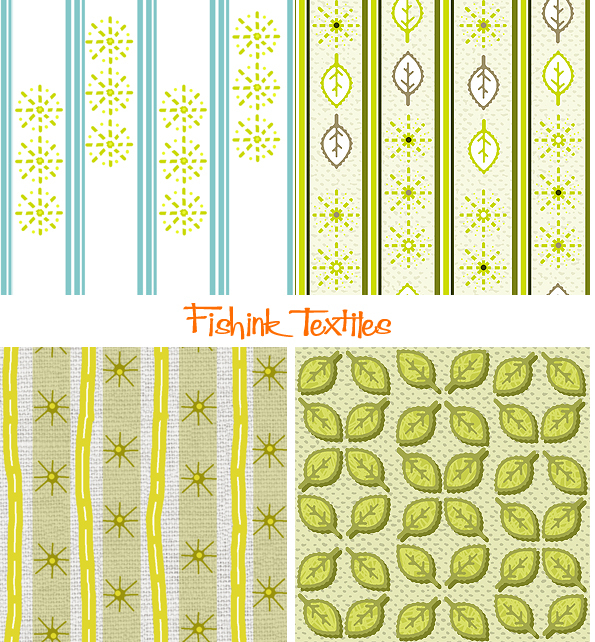 And a few other fabrics I created around the same time. I had great fun creating this collection and although the work was very intense and highly detailed (all produced using a fine nibbed Rotoring Pen), I really enjoyed the whole process. This next competition was created to allow students from different disciplines to work together. 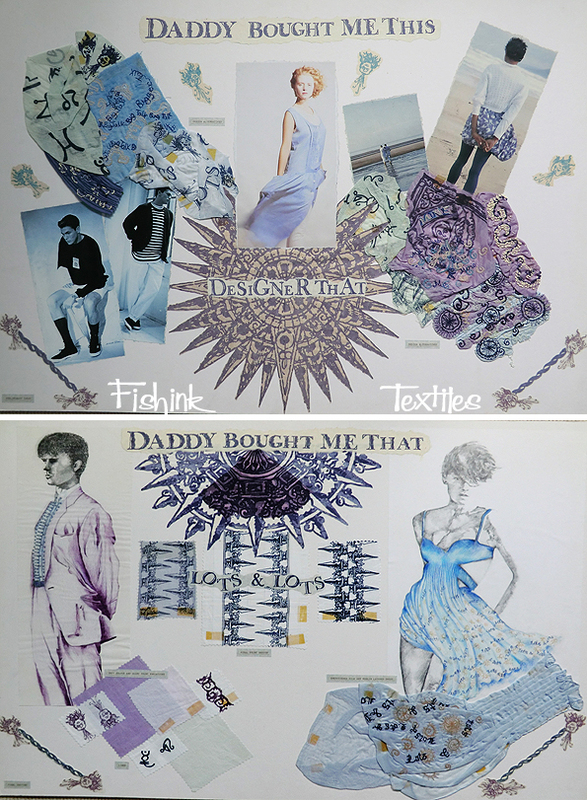 I was a print designer who teamed up with Carol Jones, an embroidery designer to create an outfit that a couple might wear for a day at the races. Again my tongue in cheek attitude came out and we took a poke at the rich and famous, creating a theme using phrases like ‘Daddy bought me this, Daddy bought me that’, and ‘Designer This, Designer That’ to mock those with that ‘I simply must have it’ mentality of the time. 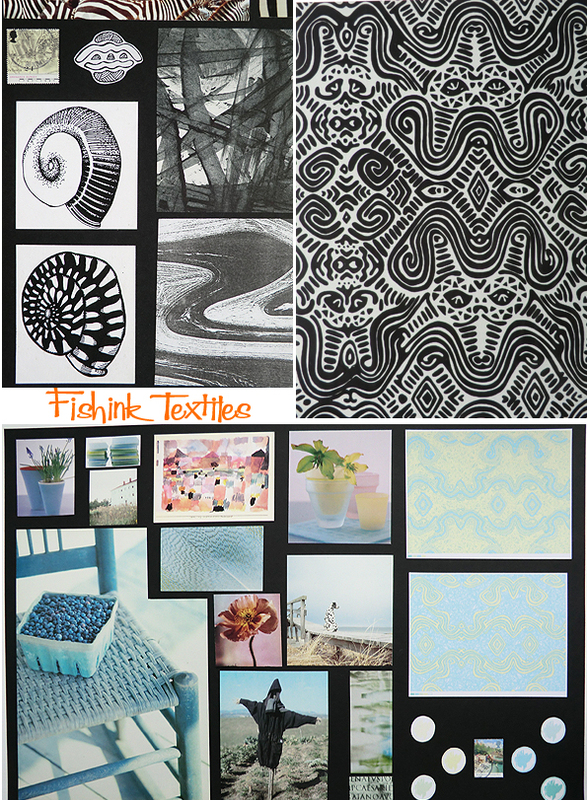 We again produced samples and created designs to illustrate our ideas. A linen suit for the gent and a silk dress for the lady. 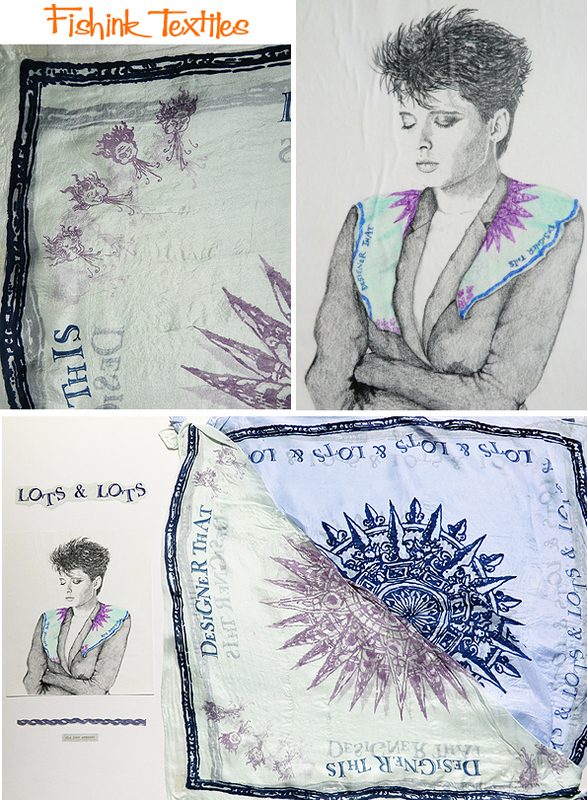 It had a slightly nautical theme and we used some wind blowing cherubs on our silk scarves to show off all that ‘hot air’ around our famous duo! I think Isabella Rossellini may have been my model for the scarf visual. 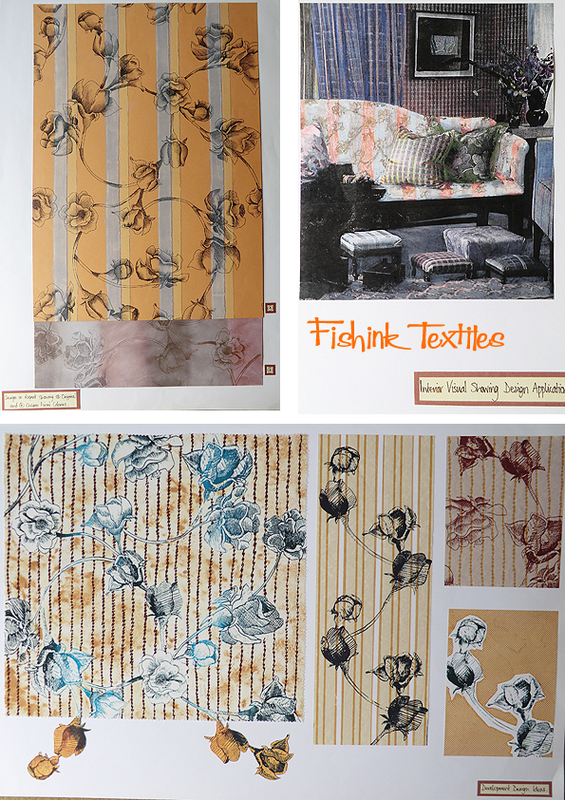 Again a great experience, sharing ideas with another designer to reach an end result we were both delighted with. 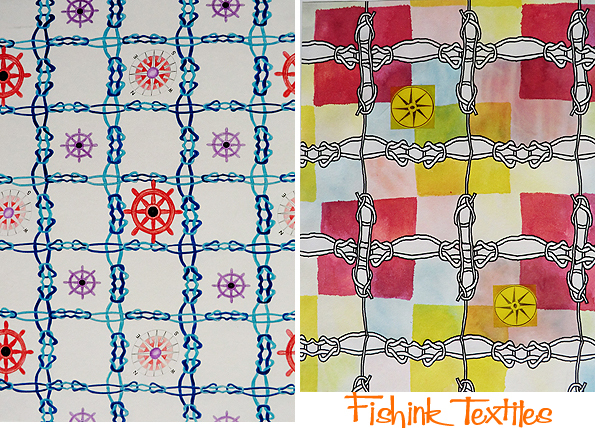 Carol did some beautiful embroidery on top of my prints which really lifted the artwork off the page. 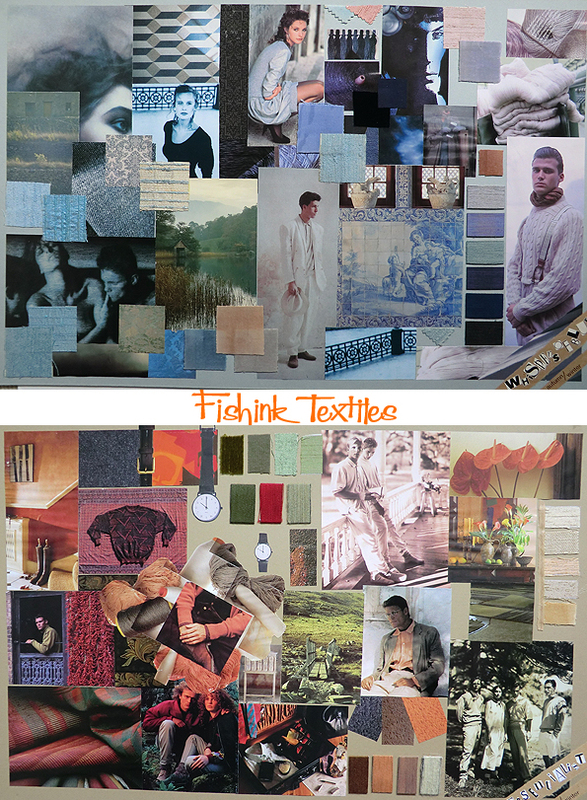 Mood boards were always being asked for. 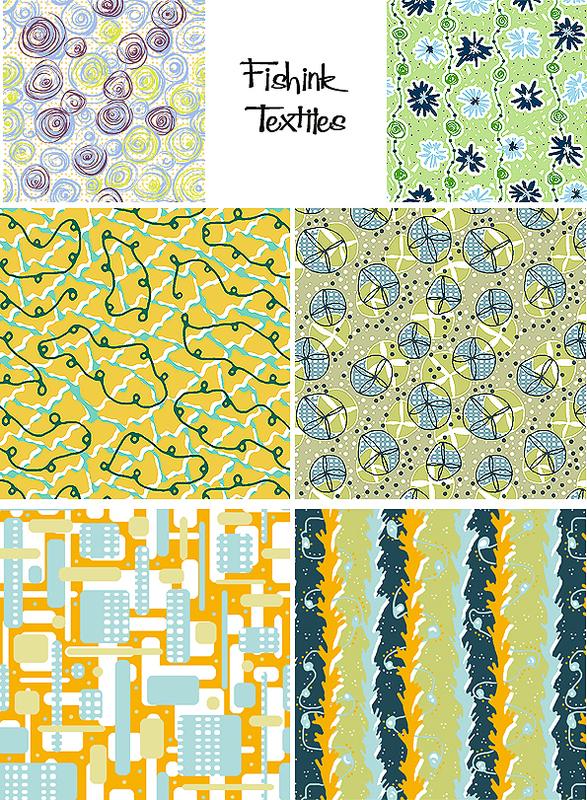 I formed these boards when I first applied to work for ABC, creating textile designs for Africa. 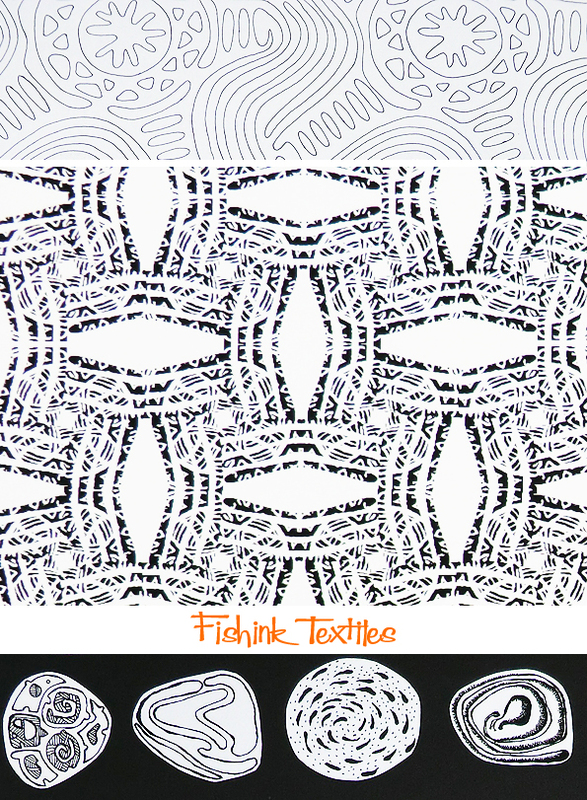 Back then I didn’t know what to draw as a European designing prints for an African market! I created my own theme using landscape as inspiration, but viewed from the air, where the shapes and movement you experience, that you can’t see from the ground, has a more dramatic feeling. 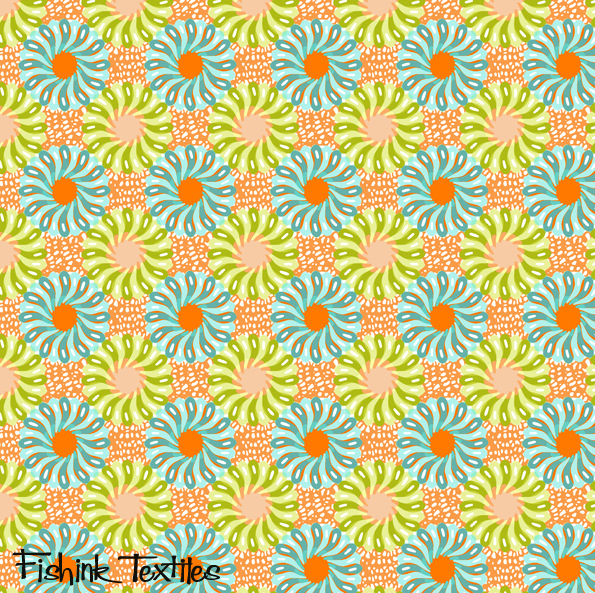 I took those initial shapes and then made them into repeat patterns. A couple of early ideas. 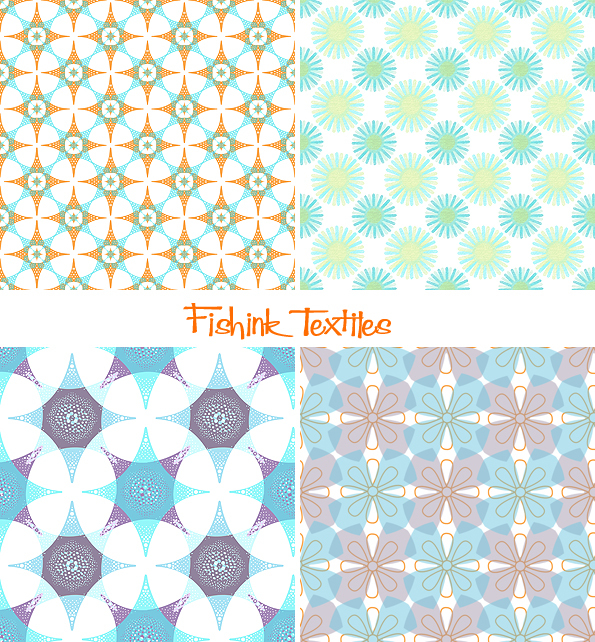 And the final design, below right. In the last 10 years I’ve created more designs for a wide variety of projects and market areas. Small and larger scale repeats. Bold, brights and more subtle shades. 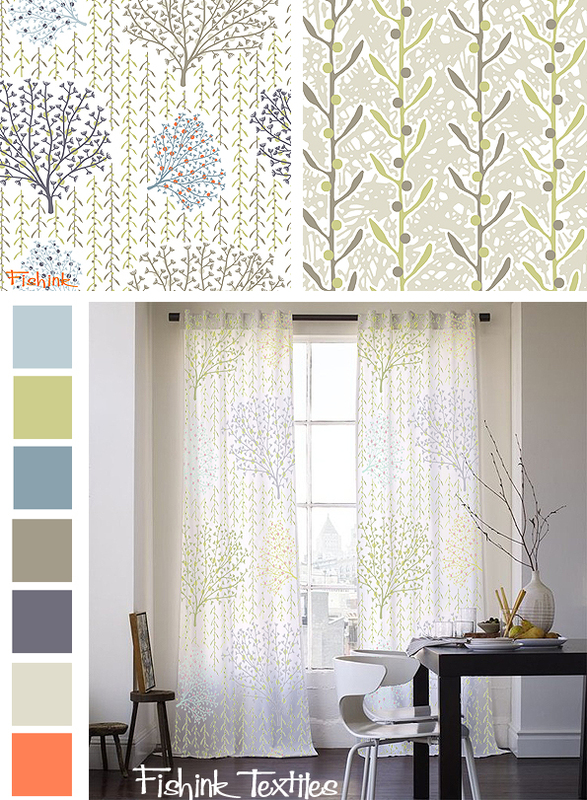 Even ideas going back to some furnishing fabrics, but thankfully, for a more contemporary marketplace. I hope you enjoyed my personal trip down design memory lane ! Cheers Helen. Catch up soon ?